LIFE DRAMA WITH JOEL GLUCK (MEd, RDT-BCT) 10TH APR 2019 ONWARDS! We are happy to announce that Joel Gluck MEd, RDT-BCT, is holding a 4-day workshop with us this April! This is the fourth workshop of it’s kind with Joel and each workshop has been well appreciated by the participants and team alike. Joel is a drama therapist, meditator, theatre artist and executive coach who offers individual and couple therapy, workshops, clinical training and coaching for performers and professionals throughout the world. 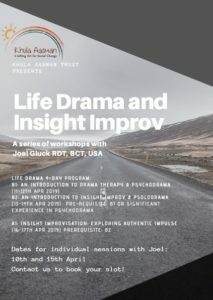 This four day Life Drama program is designed to introduce participants to drama therapy, psychodrama, and Insight Improvisation, and is appropriate for therapists and other mental health professionals, educators, coaches, performing artists, as well as those interested in their own self-development and personal growth. It is the basic, introductory program to Insight Improvisation and is a prerequisite for most advanced programs. Khula Aasman Trust invites you to be part of the workshop, and learn new techniques to explore the self and enhance the skill set required while working with people and building resilience! For details about the workshop, refer to the flyer. Don’t miss out on this fabulous opportunity! Book your slot as early as possible. Please mail sarita.khulaaasman@gmail.com to confirm your participation!